This is a Xerox Foundation University Affairs Committee (UAC) collaborative grant to work on Advanced and Scalable Graph Signal Processing Techniques, in collaboration with Arijit Biswas and Anirban Mondal, research scientists at Xerox Research Center India (XRCI) Bangalore. We plan to investigate robust mixture models and techniques to deal with graphical data. – HUMAVIPS: Humanoids with auditory and visual abilities in populated spaces (2010-13). 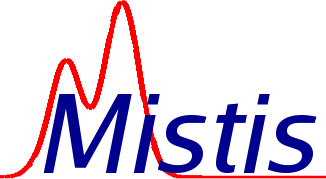 Mistis is involved in this three-year European STREP project which was in 2010 the only INRIA coordinated project granted in the highly selective FP7-ICT program of the European Union. It started in February 2010. The goal is to develop humanoid robots with integrated audio-visual perception systems and social skills, capable of handling multi-party conversations and interactions with people in realtime. The partners involved are team Perception and Mistis from INRIA Rhone-alpes (coord. ), the Czech Technical University (CTU), Aldebaran Robotics ALD France, IDIAP research institute in Switzerland and Bielefeld University (BIU) in Germany. [Link]. – POP (Perception On Purpose, 2006-08), European STREP FP6. I coordinated the Mistis part for the POP European STREP (Perception On Purpose) coordinated by INRIA and involving team Mistis and Perception. The additional partners involved were the University of Sheffield, UK, University of Osnabrück, University Hospital Hamburg-Eppendorf in Germany and University of Coimbra in Portugal. The objective was to put forward the modelling of perception (visual and auditory) as a complex attentional mechanism that embodies a decision taking process. 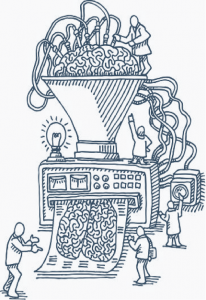 Our contribution was to the development of theoretical and algorithmic models based on probabilistic and statistical modelling of both the input and the processed data. The final review of the project was held on December 11 and 12, 2008 with in particular a live demo running on the POP audio-visual head regarding multispeaker localisation using the algorithm we developed (Khalidov et al. 2009). Further details on the project web site [Website]. – I-VP: Intuitive Vision Programming (MINALOGIC), 2009-12. This 33 month project is coordinated by VI Technology, a world leader in Automated Optical Inspection (AOI) of a broad range of electronic components. The other partners involved are the Centre de Morphologie Mathematique (CMM) in Fontainebleau and PIGE Electronique in Bourg-Les-Valence. The NOESIS company in Crolles is also involved for help with software development. The overall goal is to exploit more intensively statistical and image processing techniques to improve defect detection capability and programming time based on existing AOI principles so as to reach eventually a reliable defect detection with virtually zero programming skills and efforts. Mistis is involved in this three year project through a collaboration with CEA – LETI addressing variability issues when designing electronic devices. The partners involved are University Joseph Fourier (LJK), CEA-LETI, and companies Raise Partner, ASYGN and Dolphin Integration. – Vahinés, ANR MDCO (Masse de Données et Connaissances). This three-year project is called “Visualisation et analyse d’images hyperspectrales multidimensionnelles en Astrophysique” (VAHINE). 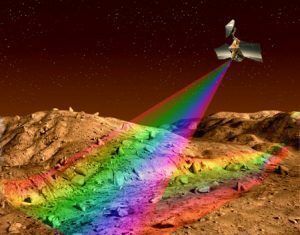 It aims at developing physical as well as mathematical models, algorithms, and software able to deal efficiently with hyperspectral multi-angle data but also with any other kind of large hyperspectral dataset (astronomical or experimental). It involves the Laboratoire de Planetologie de Grenoble, the Gipsa-Lab, the Observatoire de la Côte d’Azur (Nice), and several universities (Strasbourg I and Grenoble I). [link]. – Medup, ANR VMC (Vulnérabilité : Milieux et climats). This three-years project is called “Forecast and projection in climate scenario of Mediterranean intense events: Uncertainties and Propagation on environment” (MEDUP) and deals with the quantification and identification of sources of uncertainties associated with the forecast and climate projection for Mediterranean high-impact weather events. The propagation of these uncertainties on the environment is also considered, as well as how they may combine with the intrinsic uncertainties of the vulnerability and risk analysis methods. It involves Météo-France and several universities (Paris VI, Grenoble I and Toulouse III). [link]. – ACI Movistar (2003-06), “masse de données” program. Mistis got a Ministry grant (Action Concertee Incitative Masses de donnees) for a three-year project involving other partners, team Lear from INRIA, SMS from University Joseph Fourier and Heudiasyc from UTC, Compiegne. The project aimed at investigating visual and statistical models for image recognition and description and learning techniques for the management of large image databases. This project is entitled HEROES for ”HEmodynamics-infoRmed atlas of brain functiOnal and vascular territoriES from multimodal MR images”. Based on the information obtained from the combination of different MR modalities for a group of healthy subjects, the goal was to build an atlas of functional and vascular territories with homogeneous hemodynamic properties to address clinical questions (Stroke and Alzheimer). This atlas would then be used as a reference to quantify vascular deviance for patients with abnormal hemodynamics (stroke) or perfusion characteristic (Azheimer and CADASIL). This project gathered three INRIA teams MISTIS, PARIETAL and VISAGES, CEA NeuroSpin and GIN (Grenoble Institute of Neuroscience). – The AINSI project (2011-12) This 2-year ARC project AINSI stood for Mod\`eles statistiques pour l’Assimilation d’Informations de Neuroimagerie fonctionnelle et de perfuSIon cerebrale. The goal was to propose an innovative statistically well-based solution to the joint determination of neural activity and brain vascularization by combining BOLD constrast images obtained in functional MRI and quantitative parametric images (Arterial Spin Labelling: ASL). The partners involved were team VISAGES from INRIA in Rennes, the INSERM Unit U594 (Grenoble Institute of Neuroscience) and the LNAO laboratory from CEA NeuroSpin. [Website]. – SeLMIC, ARC INRIA (2007-08). This 2-year ARC project was supported by INRIA, [Link]. SeLMIC stands for “Segmentation Longitudinale et multimodale par IRM d’anormalites cerebrales”. It aimed at developing new statistical methods for the segmentation of multidimensional MR sequences corresponding to different types of MRI modalities and longitudinal data. The applications included the detection of brain abnormalities and more specifically strokes and Multiple Sclerosis lesions. The partners involved were team Visages from INRIA in Rennes, the INSERM Unit U594 (Grenoble Institute of Neuroscience) and Laboratoire d’Informatique de Grenoble (LIG). – ChromoNet, ARC INRIA (2007-08), [Link], for Computational Analysis of Inter-Chromosomal Interaction Networks. It was coordinated by Marie-France Sagot from former team Helix. It aimed at the computational inference and analysis of inter-chromosomal interaction networks. The additional partners were the SSB (Statistiques des Séquences Biologiques) group at INRA and the Nuclear Organisation team at MRC, Imperial College London. – IBN (Integrated Biological Networks), ARC INRIA (2005-06), [Link], for Integrated Biological Networks. It was coordinated by Marie-France Sagot from former INRIA team Helix. Its main objective was to analyse the links between regulation, organisation and evolution of genomes and biological networks. The other partners included two other INRIA teams (Helix and Symbiose), Pasteur Institute and INRA, Jouy-en-Josas.